I love people watching. Sitting in the airport or a restaurant and watching everyone is my favourite hobby. 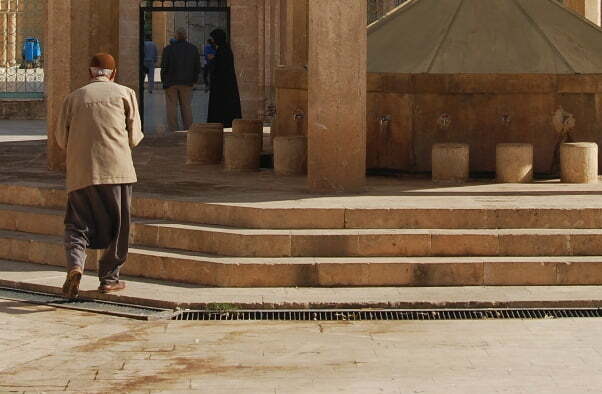 I cannot remember though, ever being more fascinated by people then when I was in Sanliurfa in Southeastern Turkey. What intrigued me most was the local dress. Living in the West of Turkey, I can see that any regional and traditional dress seems to have been replaced by the brand name of Levi. Even if I look at the women covering themselves, it is hard to spot any regional trends and often it is just labelled as countrywide Islamic chic. 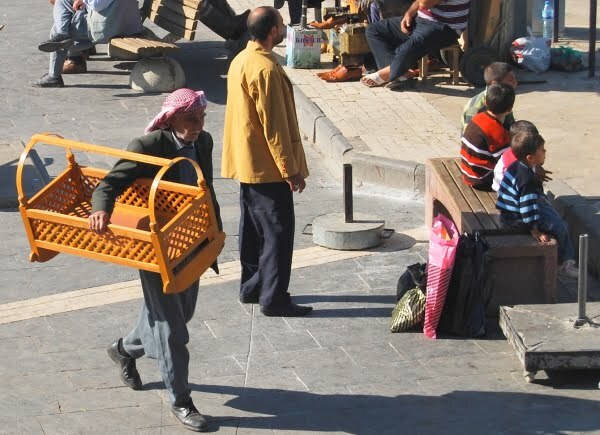 The general dress code in the Southeast region of Urfa has a more Arabic desert look to it but it was easy to spot the regional influences, especially when comparing local dress codes to the neighbouring provinces of Mardin or Gaziantep. The striking similarity between men and women is that both wore purple head scarves. I have researched the Internet and there are two explanations for this. 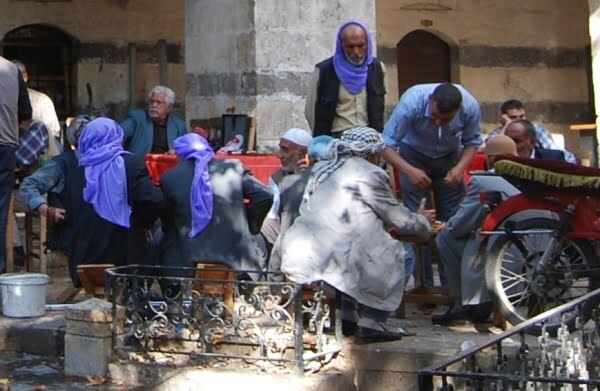 One is that the wife of a previous Turkish prime minister wore a purple headscarf when visiting Sanliurfa and the trend caught on. Another traveller writes that her guide said a different colour is chosen every year. The purple headscarf is everywhere and I couldn’t walk ten minutes anywhere without seeing a man or woman wearing it. In terms of conservative, it was strict. Not all, but many women wore head scarves and covered their arms and legs. The striking difference was that some older generation of women were wearing the same uniformed robes with the purple head scarves. Some robes were long, velvet and black or deep purple colours while others were mute brown. They are worn outside of the home and it resembled a tribal dress to show they were from a particular village or region. I also noticed that the women paid great attention to their eye make-up and it was perfectly applied. My one regret is not signing up to a tour to get more information on the dress code of Urfa for women as information on the internet is limited. They are narrow at the ankles but wide at the waist and a drawstring gathers the material so it is loose and ideal for hot weather. Turks on the west coast rarely wear these types of pants but they seem popular in this area. I remember the pants from my childhood because growing up in the UK, we always called them Hammer pants because they were the trademark of rapper MC hammer. 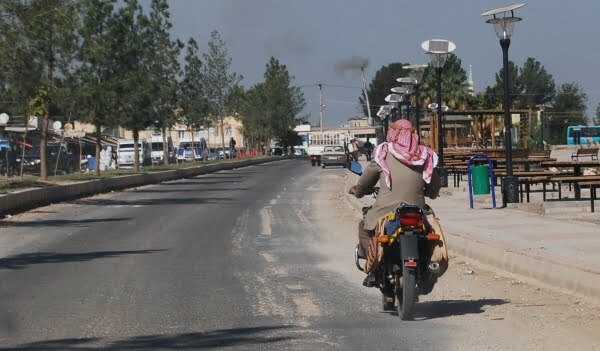 If men were not wearing the trademark purple headscarf, they usually wore the checked Keffiyeh to protect them from direct sun exposure and also dust and sand. I knew the culture in Urfa is a mixture of Kurdish, Turkish, and Arabic however twice we stopped to ask someone a question and the answer was they only spoke Arabic. I have always been led to believe that the south-east is Kurdish dominated, so to find out they only spoke Arabic really threw me. I first I thought it weird that a Turkish citizen could not speak Turkish but on the west coast of Turkey, there are many expats who only speak English. Such is the diversity of this country. 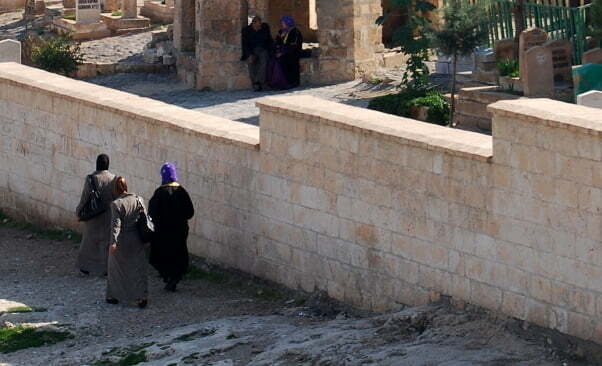 If you travel to Sanliurfa in Southeastern Turkey, look at the local dress codes. They are captivating. The men look smart and the women are beautifully dressed. Your English is very good Mehmet and thank you for taking the time to tell us about this. It is really interesting to learn about these things. ?alvar (for you shalwar) is used by elder generation on different reasons such as tradition, habitual and comfort. (Also it hides body curves see it from religious window) There are two style; Siverek ?alvar? and Urfa ?alvar?. Siverek ?alvar? has long stripe almost to ankle but Urfa ?alvar? has stripe that only reaches knees. Salvar colour is mainly chosen as middle-dark or dark. I want to correct you that only kurds use salvar our Arab citizens use trouser or robe. You have encountered two citizens who have spoken only Arabic during your visit. I want to remind you Ottoman Empire that was multinational empire. Turkish Republic its inheritor. In our region at rural areas it was normal. Recently it is being destroyed by speed communication tools. Also my grandmother couldn”t speak Turkish who only could Kurdish. I wish you can understand properly my explanations inspite of my imperfect english. I love people watching too! It’s interesting to observe the people around you instead of just going to see the sights. 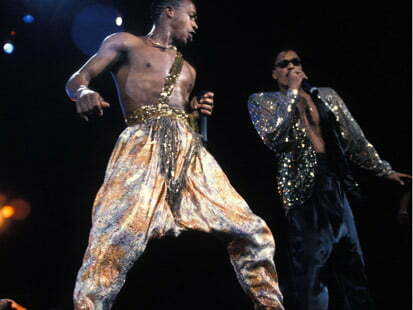 Also, I have to agree about the MC Hammer pants! Merry xmas to you as well Debs – Have a good one! I wondered where you had been Di as not even seen you on FB. For Istanbul, Debs likes to stay in Taksim as it is close to shops etc but I like to stay in the Sultan Ahmet area which is close to all the sites to see such as the Blue mosque, Hagia Sophia, cistern and Topkapi palace. Then the grand bazaar is about a 15 minute walk from there. Send me a message on FB if you have any more questions. Is that another fan for people watching then Jennifer? It is fascinating to people watch. It really gives insight into the culture. Totally MC Hammer pants! 😉 Another great post Natalie. I love people watching as well. When we were in Ad?yaman this summer, it was very hot so I was wearing long shorts (at my knees) and a simple t-shirt. Hubby was also wearing shorts. Not sure if it was our attire or our blond hair, but we definitely got some looks. All the locals were wearing long robes/pants like the ones in your photos, but I didn’t notice the purple scarves there. Maybe I put 2 and 2 together and made 5 but I was just as surprised as Natalie that she met Turkish nationals that couldn’t speak Turkish. For all its qualities, Turkey isn’t a country that generally accepts its citizens not speaking Turkish (though a linguistically incompetent expat like me gets away with it). I always knew MC hammer was a copy cat! See the comment above from Pat. It looks like the guide was telling lies Jade! Staying put on the west coast for now Jack as too much writing material to work my way through. Still got some articles for my med tour to write up!! You might be right with the political statement Alan. Would be interesting to find out which was the previous prime minster that visited and what party they belonged to. As far as I know Urfa is AKP but would need to double check that. Very traditional Angela and wonderfully exotic. Hi SRM, a tribe colour sounds more likely for the purple headscarves.While I did not meet any Syrian refuges during my time in the south east, I was told that quite a few are settling in the cities of Turkey and not just staying in the camps. Glad someone else admits to it DJ and Urfa is one of the best places to do it. Well, an old friend who’s the chief buyer for Harvey Nicks tells me purple is ‘on trend’ for 2013 so perhaps these ladies are ahead of the times! I’m constantly amazed at where you end up. Where is she going next? Well, the purple scarves are certainly not this year’s colour as I’ve seen them in Urfa for many years now. So interesting that the traditional dress changes by region! I love the deep hues of purple in the head scarves, pretty. this is one of the great pleasures of travel without a fixed schedule – love people watching. J bought some of these scarves when we were their a couple of years back – she enquired about them and was fobbed off with ‘fashion’, but old men are not going to wear them for fashion reasons. My guess is that they are making a political statement. Great photos, the place looks very traditional. 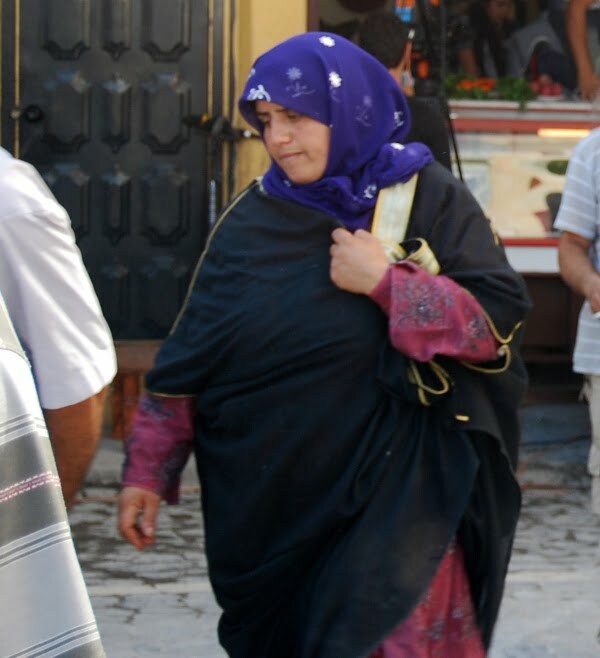 Our guide in October 2012 told us that the purple headscarf signified a specific and large tribe in the area. And Shane, not refugees likely, unless we’re talking about hundreds of years ago. East starts to meet west in Urfa. As we were returning home from the east we were seeing Turkey becoming more western but it would have been more exciting to see the gradual changes in culture – especially to hammer pants – if we were travelling in the other direction. Maybe the Arabic-only speakers are refugees from Syria?